After breakfast at the hotel, I headed out to the train station, sharing a taxi with fellow travelers at the hotel. One way taxi from town center (or from my hotel – Maymyo) costs about MMK 3,000 per taxi. We were three of us so per person costs was MMK 1,000. It takes about 5-7 minutes to the train station. I recommend reaching the train station at least an hour before the train departure to ensure a seat, especially if you’re getting a upper class seat. Tip – If you can, reserve tickets a day in advance between 3-5pm only. 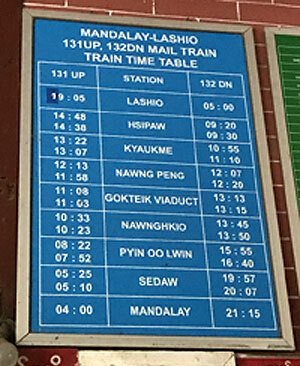 The train arrives from Mandalay, just before 8am and leaves at 8:22am from Pyin Oo Lwin. The upper class ticket costs MMK 2,750 per person and is checked against your passport. Important – The lines at the ticket counter are for ordinary class, but if you are reserving a seat in upper class, then go directly to the room on the left of the ticket counter and approach the person sitting inside. 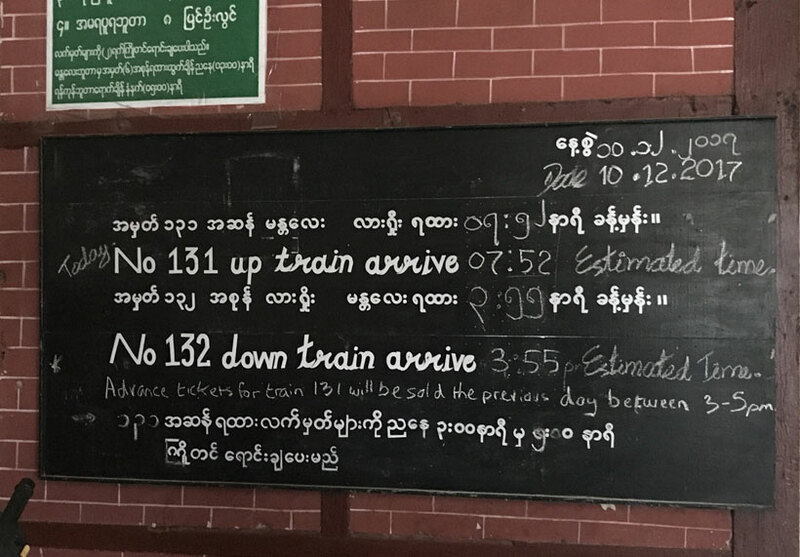 Pyin Oo Lwin station is small but has restroom facilities and waiting rooms as well. The train arrived and departed almost on time. The upper class compartment is in the front of the train and while there were some empty seats, these usually get reserved and full, so make sure to book at least a day in advance. The train departs on time, slowly chugging its way through the countryside and small towns of Myanmar. The entire journey of 7-8 hours to Hsipaw is beautiful and a must-see for any traveler. Be careful of the grass and bushes hitting the windows if you’re next to it! The main sight along the way is Gokteik Viaduct, a railway trestle bridge built by the British colonial empire during the early 1900s. At the time it was built, this was the largest trestle in the world, and it is still the highest bridge in Myanmar. It was almost 3pm when we reached Hsipaw. Most guest houses in Hsipaw will have tuk-tuks to pick up passengers from the station to the hotel, free of cost! This small town is always buzzing with tourists who take this world-famous train journey, arriving in the great Shan state. After checking in and a nap later, I headed out to have dinner at Mr. Food restaurant, a 10 minute walk from the hotel. Calling it an early night, I was ready to explore Hsipaw!